Truly a sight to see, the Amish Lancaster Queen Anne Dining Chair captures the elegance and sophistication of Queen Anne, or formal style furniture. 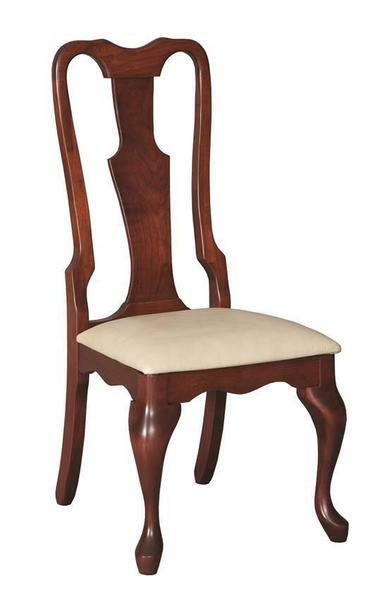 These dining chairs have front cabriole legs and gently curved back legs. Scalloped detail on base of chair seat. Chair back is sculpted with grace. These are dining chairs that dress up the dining room. Our Amish Lancaster Queen Anne Dining Chairs come with a 20-Year Limited Warranty. I called and missed you this afternoon, so I’ll leave this e-mail. I would still like to talk to you, however. I spoke with Katie earlier in the day. We took delivery of our Queen Anne dining room table and chairs, and matching writing desk yesterday. I took off work for the afternoon to meet Gary, so it was all in place when my wife walked in after work, about 5:00 PM. She was thrilled, as I knew she would be. I spent most of the late afternoon looking at it, under it, looking at the detail on the drawers, the table latches, fit, finish, color, and so on. It is a remarkable level of quality, as you promised. And the color and fabric, which you helped us select, are perfect, and they match well with our other things, rug, etc. Please pass along our good will to the shops involved. They have done some very fine work, and we could not be happier. The high level of craftsmanship is obvious. (I looked at the drawers, for example. Not only are they dovetailed, but the rear of the drawer is “stop dovetailed” so you don’t see the pins on the back of the drawer. What a cool quality touch!) As a woodworker myself, though a mere amateur, I am impressed. Also be sure to recognize your carrier, Gary, for doing such a great job preserving the pieces in transit, and delivering them safely to our home. His communication was excellent, and set-up went fine, as you have come to expect, I’m sure. I will request him next time I see you for furniture. You know, altogether, the biggest problem we had doing business was my e-mail thinking your messages were spam. Once I fixed that, the rest has all been easy! That says a lot. It has been great to do business with JMX. I just received a stunningly beautiful Amish cherry dining table and 8 chairs! Yes, I am overwhelmed! Simply beautiful workmanship, just top of the line from top to bottom, and I love the feel of the cherry wood. It looks great in the dining room, but unfortunately I am still in the 20th century and do not have a digital camera, so I can't send pix. Thanks for all your help. You have a good company there.